There is something rather ironic about this picture that the left in this country will likely take offense to (I'm not disturbed, I wonder if he even knew the flags were there). 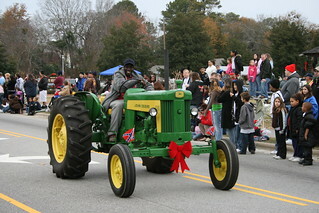 I should mention that the tractor behind this one had a "The South Will Rise Again" banner affixed to the front of it. What a way to open up a parade. Digg this if you get a chance.